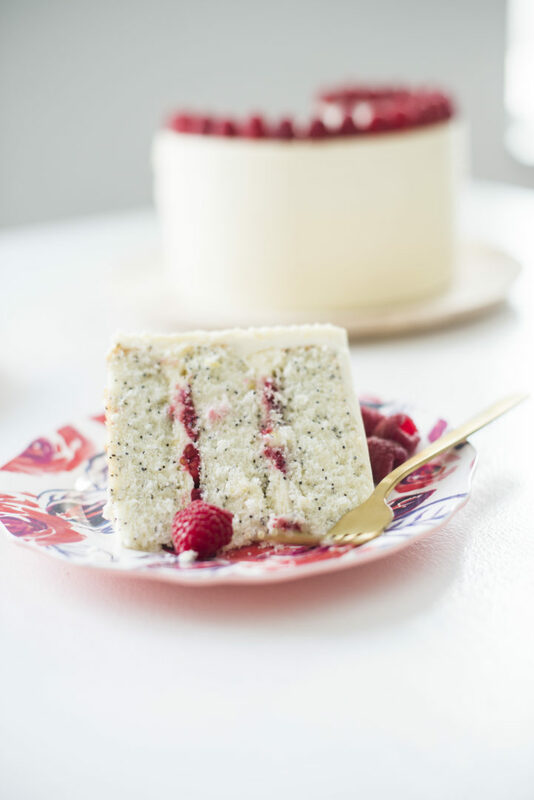 Tender and light lemon poppy seed cake layers with lemon cream cheese frosting and fresh raspberries. Hi! I’m back home for a couple days before I have to head out for another work trip (this month has been crazy, you guys! Can’t wait for things to settle down a little in March). The night I got back, I was able to join some of our family and closest friends to celebrate the upcoming nuptials of my baby sister. Kenzie is ten years younger than me, so the fact that she’s getting married is a little surreal and is making me feel far older than I feel comfortable with. We’re so excited for Kenzie and Stephen, and I’m particularly eager about their wedding cakes… because I’ll be making them! Stayed tuned for all of that! For Kenzie’s wedding shower cake, I went with the Lemon Poppy Seed Cake with Lemon Cream Cheese Frosting (adapted from Technicolor Kitchen). This is my go-to wedding shower or baby shower cake. It’s light and fluffy and tastes so fresh. The ladies love it and there’s never a single crumb leftover. With a little lemon simple syrup soaked onto each cake layer, the flavor in this cake is unreal. I also love that the possible flavor combinations in this cake are so versatile. Instead of raspberries, you could use blackberries, strawberries, blueberries, etc. You could also use a compote filling or even preserves. 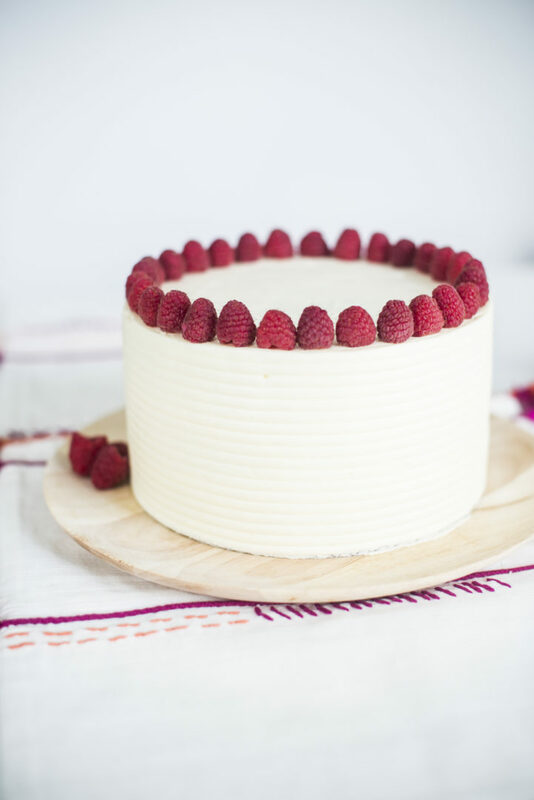 I think once you try this cake, it will be on your list of go-to’s as well! 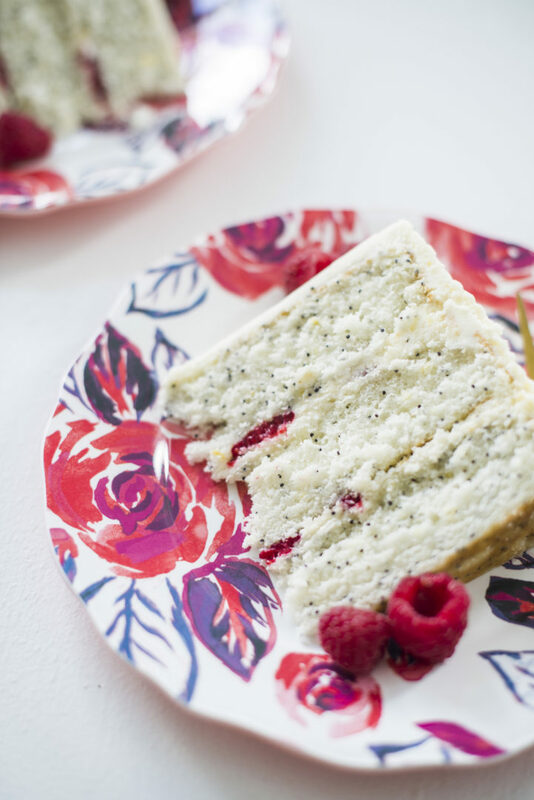 Lemon poppy seed cake layers with lemon cream cheese frosting and fresh raspberries. Preheat the oven to 350 degrees F. Spray three 8-inch round cake pans with nonstick spray, line the bottoms with parchment paper and spray again. Set aside. Combine the flour, 1 3/4 of the sugar, baking powder, salt and poppy seeds in the large bowl of a stand mixer fitted with the paddle attachment. Beat on low speed to blend the ingredients and break up any lumps, about 30 seconds. Add the butter, lemon zest and 1 cup of the buttermilk to the flour mixture. Beat on low until completely mixed, then raise the speed to medium and beat for two minutes to lighten and aerate the batter. In a medium bowl, combine the egg whites with the remaining 1/4 cup buttermilk and whisk to blend thoroughly. Add this mixture to the batter in 2-3 additions, scraping down the sides of the bowl and beating only enough to incorporate. Divide the batter among the prepared pans. Bake for 25-30 minutes (mine were done at 24 minutes, so keep an eye on them around 20 minutes - remember, you want a few moist crumbs to come out on the toothpick when you check the center of the cakes). Let the cakes cool in the pans for 10 minutes. While the cakes are cooling, make the lemon syrup: in a small saucepan, combine the remaining sugar and lemon juice. Bring to a boil, stirring to dissolve the sugar. 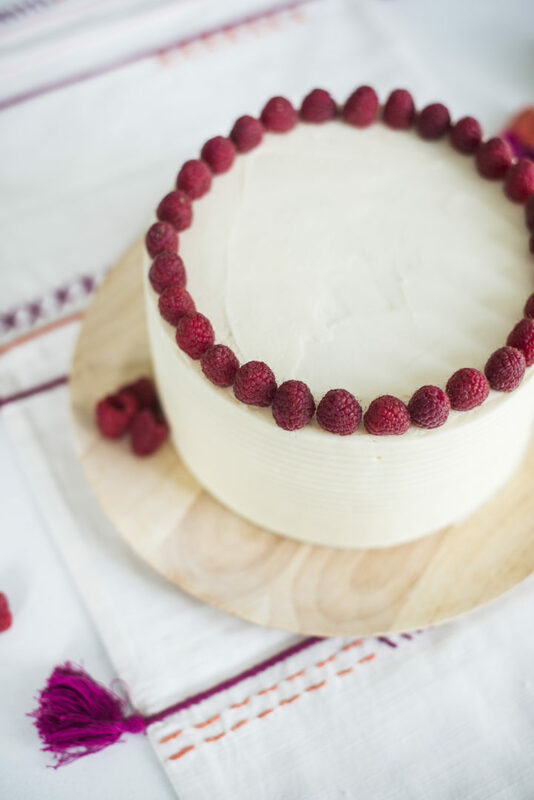 Turn the cake layers onto wire racks and gently poke holes on the top of each cake layer with a toothpick. Generously brush each cake layer with the lemon syrup. Let cool completely. In a large bowl of a stand mixer fitted with the paddle attachment, beat the cream cheese and butter on medium speed until light and fluffy. Gradually add in the sifted powdered sugar, 1 cup at a time, beating well after each addition and scraping down the sides of the bowl. Continue to beat until very fluffy, about 3-4 minutes. Add the vanilla and lemon extract extract and beat well. Before using on your cake, mix the frosting by hand with a wooden spoon to push out the air pockets. Place one cake layer, bottom side down, on a cake plate or cardboard cake board. Spread about 1 cup of frosting across the top of the cake layer. Make sure to get eye level with the cake to ensure the frosting is even. Cover with fresh raspberries. 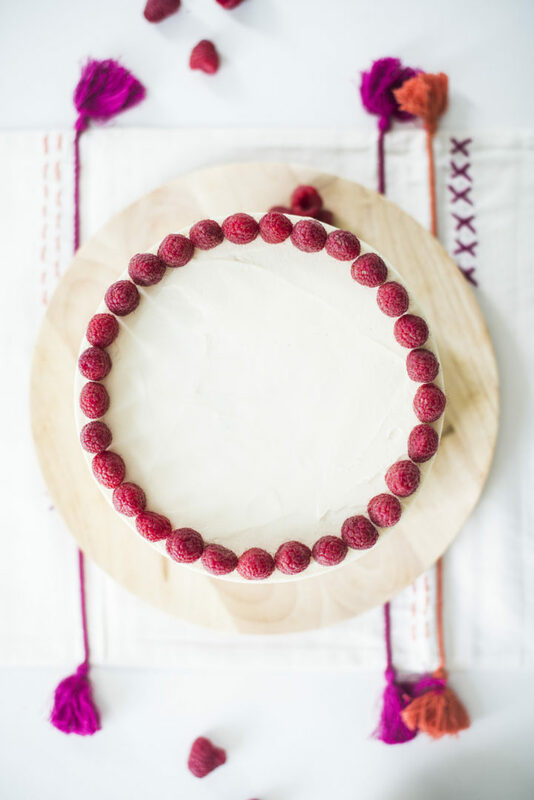 Place the next cake layer on top of the raspberries. Gently spread about 1 cup of the lemon cream cheese frosting over it. Repeat steps one and two for the second cake layer. Place the final cake layer, top side down, on top. Give the cake a quick crumb coat and chill for 10 to 15 minutes in the freezer before frosting the entire cake. *Poppy seeds absorb moisture. Make sure to soak the seeds to help keep the cake from becoming dry. Hi there. This is gorgeous. May I ask what colours you used to get that effect with the icing? Thank you! I used pink food gel with a little brown to create a more vintage looking pink. Hi! I was wondering if with the cream cheese frosting, does this cake sit okay at room temperature? It can sit out for about 4-5 hours indoors. Anything longer than that, I’d cover it completely and refrigerate it. Do you think this recipe would work for cupcakes? Never mind, I just tried it and they turned out beautiful! I filled the cups up half way and baked them for 15-17 minutes. Do you think this would turn out converted to cupcakes ? Yes, I’ve had another baker try them as cupcakes and they worked great. Fill the cups half way and bake for about 15 to 17 minutes. Hello! I really want to make this cake for a baby shower for one of my best friends this weekend but I am wondering if this will be enough cake. There will be about 20-25 people, do you think this is enough cake for everyone? Thanks! How did it go? Sounds like I might be too late. The cake can feed about 20-22 people if you do small slices. Hi Courtney! I know this is an old recipe but I’m looking up ideas for Easter dessert. Do you think it would be ok to skip the poppy seeds? We have kids who won’t touch seeds. Would it affect the texture to leave them out, and if so, what should I replace them with? Thanks!! Hey! You can absolutely just leave the seeds out! No need to replace them with anything. yes you absolutely can make this cake ahead of time with the syrup on the cake layers. I’ve done it lots. Beautiful cake! I’m making a lemon wedding cake and I’m wondering if your recipe will double well? The bottom tier will be 12″. If I wanted to do 3- 6″ layers do you think cutting the recipe in half would work? Or would that not give me enough batter? Can’t wait to make this, thanks! That wouldn’t give you quite enough batter, you’d want to reduce it by 1/4 or just make the full recipe and bake four layers. so i should use bleached cake flour, right? 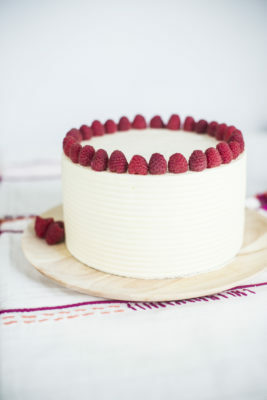 and also, culd i sub the fresh raspberries inside of the cake for jam or homemade preserves? thanks! I use unbleached flour, but bleached should be fine. And totally, you can sub fresh berries for preserves. It’s not the best for piping but will work. The cream cheese makes it a tad softer. So, I have noticed there are amazing food photographers and there are amazing recipes and not always do they go together. As a photographer, I LOVE your photos! As a person who loves to make amazing food for the people I love, I was pretty impressed with this recipe. I think I made a few mistakes my first time making this. I should have used all the lemon simple syrup, I should have added more raspberries (cuz yum!) and I baked at 350 degrees for 21 minutes and still think I over cooked them. It did come out a bit dry and slightly crumbly. Is it the baking or possibly over mixing? Also would love to try these as cupcakes! Can’t wait to try this again and I have started a list of your other recipes to try! Thank you! Yes, I wonder maybe if you oven runs a little warm too. If you make it again or another recipe, try reducing the time by a few minutes. When you insert a toothpick into the center of the cake, you want a few moist crumbs to come out on it. It’s usually over baking the cake layers that causes the to be dry. Quick question. I am making this and soaked my poppy seeds. But after soaking I only have 1 tablespoon. Not sure if I should soak more or if that’s normal?